The Broncos met their second division rival of the 2011 season in the Mile High City, the Chargettes and came thisclose to almost tying the game & then winning. First half was ugly for Denver on both sides of the ball. The defense was getting run over by Rivers & Co., and the Kyle Orton led offense was getting stuffed with 3 'n outs. But the second half, now that was a football game. Far from a pretty game but more bearable to watch by far. Denver Head Coach John Fox FINALLY jumped off that Orton train and gave Tim Tebow the entire second half to work with. First half was not good at all for Orton's starting job. I think after the bye week, he loses it to Tebow. Tebow struggled at first, had trouble with 3 snaps while behind center, a few bad passes but look at the stats. They speak volumes. Each quarterback had a half to play and yet the stats for each one tell 2 completely different stories. Orton was 6/13 for 34 yards no touchdowns but his guaranteed INT. 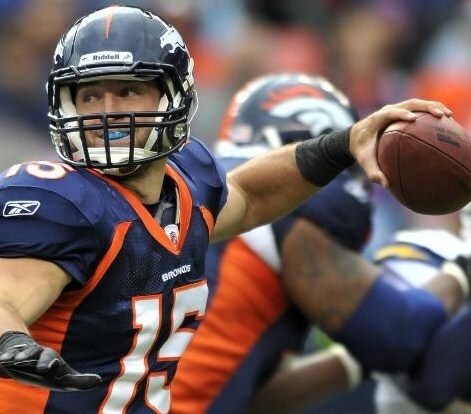 Tebow went 4/10 for 79 yards, 1 rushing TD for him & a pass to Moreno for a TD & no interceptions. 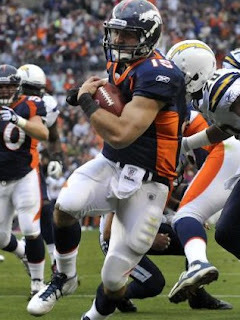 Tebow more than doubled Orton's total passing yards. I don't know how much more I can plead for Tebow's case. And then there's Tebow's effort, his athleticism on the field and his passion for the game. The man is huuuungry! He's a tough one to take down, to catch. The very last play of the game, he had those San Diego DE's running all over trying to catch him. Orton would've been sacked instantly. I will be my bold blunt self and say Tebow gets the majority if not all 1st team reps in practice when they return from their bye and we will see much more of him when we come back in week 7 to face Miami. As for the rest of the offense, it was a quiet day. Brandon Lloyd & Eric Decker were nearly invisible with Lloyd catching 1 pass for 20 yards and Decker catching 2 passes but for negative yardage. Was really hoping Decker would have another stand out day. Willis McGahee was on fire yet again earning his 3rd consecutive 100-yd rushing game. So nice to see Denver get their run game back to decent numbers. McGahee went 125 yards on 16 carries. No touchdown but still solid day for the RB. 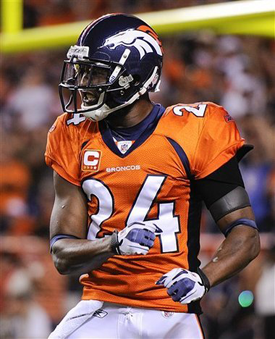 Knowshon Moreno has become more of a 'change-of-pace' back for us but managed to score the 2nd Bronco touchdown in the 4th quarter on a 28-yard pass from Tebow. #27 had an awesome run into the end zone. Was real nice to see him get that TD. Overall, ok day for the offense. 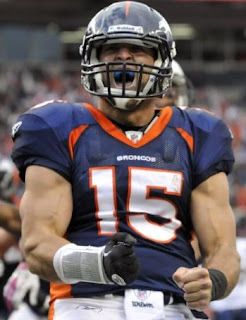 With more time, Tebow will get that consistency we need from a QB. Gotta stick with him though, none of this switching back & forth between quarterbacks. That doesn't work & it isn't fair to anyone, especially the players. 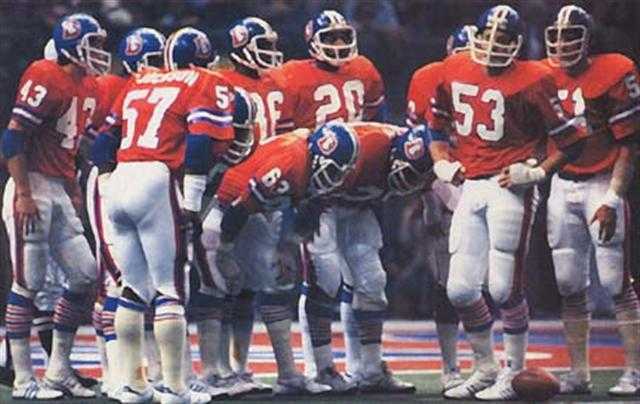 The Denver defense go t into a rhythm in the 2nd half after a dismal first. Early in the first quarter Rivers was intercepted by Cassius Vaughn who took it back for a 55-yard pick-six. Couldn't tell you the last time Denver got one of those. lol Now Champ needs to get back in the habit of doing that. Miss watching him get INTs. After that, the defense got quiet and the Charger offense kept on rolling over us as our offense wasn't staying on the field very long. Overall, Rivers was sacked 4 times by 4 different guys, which is always funny. Credit goes to D.J. 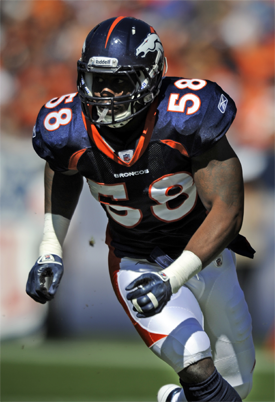 Williams, Robert Ayers, Von Miller & Ryan McBean. Where are ya Doom?? Then in the 4th quarter, when Ayers got his hands on Rivers, he also forced the very hated #17 to fumble and the Tebow-led offense went on to bank it with a touchdown. Defense definitely came to life in the second half. More productive for sure. Joe Mays continues to make a name for himself too leading the team in tackles (8) with 1 assist. #51 was a beast out there today. D.J. Williams came in a close second with 7 tackles on the day. In some not so good news, veteran Safety Brian Dawkins left the game in the first half after suffering a neck injury. He may have a concussion but I hope & pray its not that bad. This would be real bad news for our already ailing defense. So now this 29-24 loss leaves Denver at 1-4 & at the bottom of the AFC West. 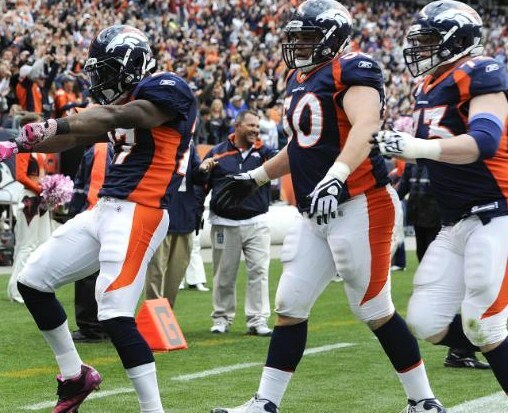 What does Denver need to do to progress after the bye? 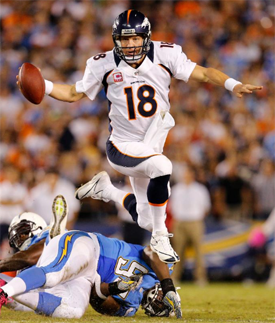 I think the transition, if made, from Orton to Tebow will help but we played a less-powerful San Diego Charger team, a team we should have beat today, especially in our house. We all know our issues go far beyond who should be QB and come week 7, we will be facing an either 0-5 or 1-4 Miami team, and if we lose that one I'd say we have even bigger problems. Any thoughts on what needs to be done for us to get back on the winning side? Whatever it is, something's gotta give for Denver. Brandon Lloyd’s only catch of the day – amazing!! I am not to worried about Dawkins, take his time getting healthy, I think Carter had a good game. Also Larsen opened up some nice holes for McGahee. And our defense is much better, when was the last time we had 4 sacks, 2 turnovers, one for a TD and won the turnover ratio. The last time we had a pick 6 was in 2006 as well, so long ago. Ayers and McBean I think played great today, I kept saying to myself that both guys look much improved. As for Haggan he looks slow and out of place. Otherwise was a good game with some improvement. Bummer Big Vick is on IR, means Thomas will have to step up. And interesting we pick up a FB. I really think Larsen is starting to come on strong. Also what do you think of Miller being sub'ed out of the base packages? Sort of answers my own question. 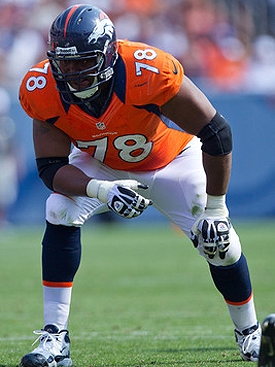 There were reports that Denver rookie Von Miler was benched in base-defense situations Sunday. 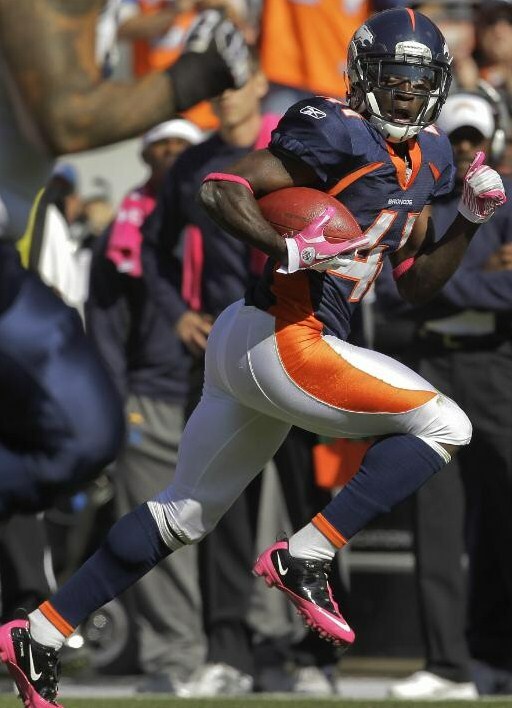 However, Denver coach John Fox went out of his way Monday to clarify Miller’s status without being asked.